Snack Girl has a problem. It is a GREAT problem to have - too much fresh spinach in her refrigerator. How did that happen? Well, out here in the middle of nowhere, we have farms. My family joined a farm share (see Fresh Produce) and we have a ton of spinach in our refrigerator. My solution is to eat it. I know I could give it away or toss it out, but that would be wasteful! So, today, I started my day with a recipe that I call, "Green Eggs". Green Eggs is a great way to try to convince your children to eat spinach (has not worked by the way). Simply put, this recipe will give your body a huge shot of nutrition to start your day. And, you won't get hungry again until lunch (I promise). Obviously most of you don't have a farm share, so just go buy one of those bags of pre-washed spinach and toss half of it into your eggs. If you don't have time to make this in the morning, make it the night before and just reheat in the microwave. Or just eat it cold! It will taste great no matter how you eat it. 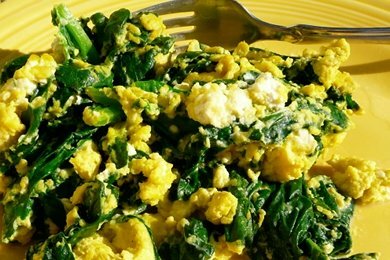 Mix eggs and spinach (removed large stems) in large bowl. Crumble in feta cheese and mix again. Mixture should be lumpy. Pour into heated fry pan and stir until cooked (about 3 minutes). If spinach isn't steaming, put lid on pan. Do you eat spinach for breakfast? We signed up for a CSA produce basket weekly through our local farmers' market, so I'll be looking for great produce ideas all summer... Keep 'em coming. Take a large frying pan (I use my large electric fry pan). Saute a little garlic in olive oil. Add lots of spinich - cover to let it wilt. Add salt, pepper, some lemon juice and hot pepper flakes. Really simple, but the lemon juice & pepper flakes really make the dish. We do this dish slightly differently - we cook the spinish till it is well wilted and then push it to the edges of the pan (I usually do this in the wok so I push it up the sides) then pour the scrambled eggs into the center and cook. As they cook pull spinach down to get scrambled in. My kids eat it but it is not their favorite breakfast. I can assure you they would NOT eat it if I added feta. Cheddar yeah, but not feta. They do love my quiche for lunch and dinner and that is heavy on the spinach (and red peppers and broccoli...). And there's always spinach in my lasagna too. I love spinach and eggs. I love to wilt it and top it with either fried or poached eggs. Doesn't work when I'm making it the night before though - this is when I scramble them. Yum either way. Yummy! I haven't had eggs in a while. LOVE eggs. I think I'd use Laughing Cow cheese instead of feta, though... never been a big feta person (my sister, on the other hand, would be ALL OVER this recipe). Yes, I do! I have been making spinach omlets for years. I like to have some tomatoes or salsa or even better, sun dried tomatoes added to mine. YUM! I also put spinach in my herbalife formula 1, meal replacement shake for breakfast. It is delish! For those who need a power breakfast to go, give the spinach a blast of heat (to wilt) and pour egg/spinach batter into sprayed muffin tins (w/o the paper). These can be refrigerated or frozen and reheated quickly in the microwave. Somehow the kids like the "muffin" look. That is too funny. I keep fresh spinach in my fridge and have been putting it in my kiddos eggs since they were able to eat eggs. They think that is how eggs are supposed to be so they eat it up and love it. I also use spinach in my fruit smoothies..tons of it and you can't even taste it! Go Spinach! My kids won't touch the green eggs either, sadly. However, proving that you can hide nearly anything in a smoothie. I have discovered that they will drink "Incredible Hulk Smoothies" which are the usual breakfast smoothies I've been making all along (usually some sort of berry, mango, banana combo) with a handful of spinach thrown in the blender. If you let it go long enough, the whole thing turns green, the spinach bits are small enough to be drinkable even for kids picky about texture, and it doesn't taste vegetal. Vitamin C from the fruit helps your body absorb the iron. Yay! That sounds great! I'm pregnant & a bit anemic (I don't eat much meat). So, I try to get iron from foods like lima beans, lentils, beans, eggs, even mulberries (mulberries are hard to find). I believe some of the iron is blocked by the folic acid present in spinach and it isn't all absorbed. Spinach contains oxalic acid that binds calcium (if not enough calcium is eaten with spinach it will take calcium from your bones thus causing osteoporosis if consumed often in large quantities) and can be harmful if you have kidney problems. And it does affect the absorbance of iron, too. Having vitamin C with it, is supposed to help you absorb more of the iron. Iron from animals is more bio-available than iron from plants. "Spinach is a source of non-heme iron...."
"one cup of cooked spinach provides ~3.5mg of iron whereas a cup of raw spinach only contains 1 mg of iron." Purée some of it and freeze it. In Jessica Seinfeld's cookbook she uses spinach purée in several recipes. One comment, one question - if you squeeze a little lemon juice on your spinach, it helps your body absorb more of the iron - adds a nice flavor and provides the vitamin C mentioned above. I just made your green eggs and spinach for lunch, but added mushrooms, red & yellow peppers, onion, and chopped fresh tomato. Am I right in assuming with the new points+ program that the points remain the same as you listed because I added 0 point vegetables? I so appreciate your website and learn from other people's comments, so keep up the good work everybody! !